I've been in a bit of a cooking rut lately. After hearing from my doctor that I may have to go on an elimination diet, and becoming acutely aware of how certain foods (including some of my favorite, unsuspecting, healthy foods, like spinach) make me feel, cooking has not been giving me quite the same joy that it usually does. Am I going to have a reaction to this? Is this organic enough? Will my head hurt after I eat this? Will I be too tired to move? Did it come in packaging (because if there's plastic involved that's a hard no!)? Are there any weird ingredients on the label? Is it organic, grass-fed, free-range, vegan, dairy-free, sugar-free, carb-free (and, let's be real, fun-free + flavor-free)? I mean, honestly, my head is dizzy trying to keep track of all the things, and I've been going a little mad trying to figure out what I can and can't eat, and if food is really even at the root of my health issues. Now don't get me wrong. There are some incredible options available for gluten-free and dairy-free versions of food that traditionally have those ingredients. I don't eat a ton of sugar so I don't crave/miss overly sweet desserts. And nothing gets me quite as excited as the fresh produce we get at our local farmer's market. And yet, tackling meal time has still been a challenge. But there are a few exceptions. *Cue today's recipe* (in case you're were starting to wonder if I was ever going to bring it up). 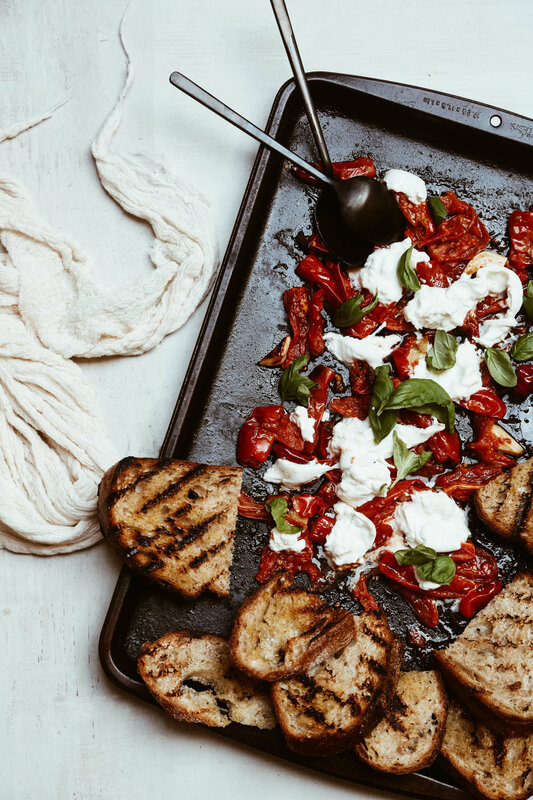 This burrata and oven-roasted San Marzano tomato bruschetta all started with the farmer's market. One of my absolute favorite things about the market, and one of the few things that has still been getting me excited for cooking, is the wide variety of produce available at the farm stands. Every week we spot new and unique produce, so we've now made it a bit of an unspoken rule that we'll grab one or two of these items, along with our regular produce, to help switch things up and keep things interesting. Which is exactly how a bag of San Marzano tomatoes made their way from the farmer's market to our kitchen. Of course, you can enjoy these tomatoes the way you would any other tomato, make them into a sauce, drizzle with a little olive oil and sprinkle of sea salt, put them on a pizza, add them to a salad, etc. 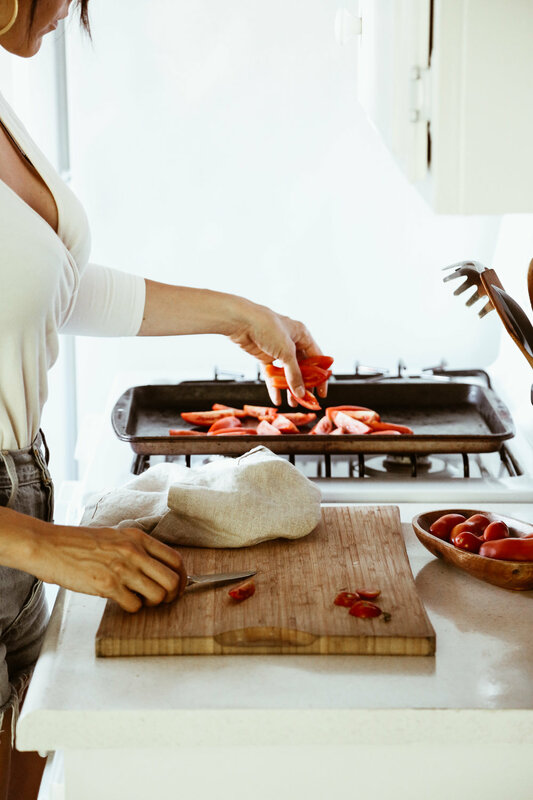 Or, you can do what I did here and make burrata and oven-roasted San Marzano tomato bruschetta and have your mind and taste buds be completely blown with the epic flavors bursting out of every single bite of this glorious recipe. Of course, the tomatoes are the real MVP of this recipe, but let's not overlook the underdogs, bread and burrata, for without them, this recipe would never have even come into existence. how do you handle a cooking rut? any tricks you use for getting out of one? Qyarter the tomatoes, then toss them on a baking sheet, along with the garlic cloves and chili peppers (if using). Drizzle generously with olive oil and sprinkle with salt. Pop the baking sheet into the oven for 15-22 minutes, using tongs to toss the ingredients once or twice throughout roasting. Once the tomatoes have cooked down and turned slightly golden around the edges, and the garlic is fully roasted, remove the pan from the oven and set aside to cool slightly. Meanwhile, you'll want to get your bread grilled and ready for serving. To do this, first drizzle or brush (using a pastry brush) one side of a bread slice with olive oil, then place it, olive oil side down, onto a preheated grill pan set over medium-high heat. Brush the side facing up with olive oil, then, after about 60 seconds, or until the side facing down is golden brown, use tongs to flip the bread over and cook until the other side is golden brown. Repeat with all remaining bread. To serve, simply add the burrata on top of the tomatoes, using your hands to roughly spread it out, then sprinkle with fresh basil. Add the grilled bread to the side of the tray for easy dipping and you're good to go. This dish is perfect all on its own as a light but filling meal. However, it also pairs nicely with a simple green salad, or it works well as an appetizer shared among friends. And, this probably goes without saying, but it also pairs quite nicely with a glass (or two) of vino (but you probably already knew that). While I prefer to serve this warm, so the burrata melts like a delicious, creamy blanket all over the tomatoes, this dish also tastes great chilled. If you are serving it chilled, as an FYI, the tomato mixture can be made in advance. Simply wait to add the burrata and basil until just before serving. Feel free to leave the chilis out (or use less) for a milder, less spicy flavor. However, another option is to remove them after roasting and before eating. This still allows the tomatoes to be infused with the flavors and have a little bit of a kick without being too intense. This recipe can easily be doubled or quadrupled to serve more people.